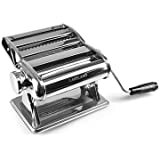 Sold by CHEFLY KITCHEN and Fulfilled by Amazon. Gift-wrap available. 【QUICKLY CREATING DELUXE HEALTHY PASTA AND RAVIOLI】- This pasta press machine simplify the job of making your own nutrient pasta at home,much easier than by hand. 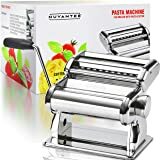 You can get that perfect fresh flavor and texture more often.Including ravioli，fettuccine,lasagne,linguine,spaghetti,vermicelli,angel hair,tagliatelle. 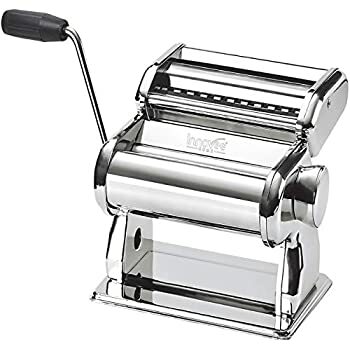 【PROFESSIONAL ERGONOMIC DESIGNS AND EASY TO USE】- Simply slip your freshly made dough in the roller, turn the crank, and you got yourself your very own pasta. 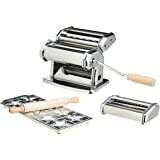 You can make different types of fresh pasta, even ravioli ! 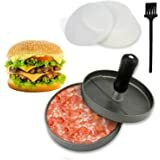 Convenient to get the delicious food with this commercial grade equipment. 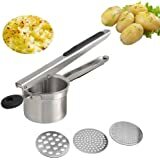 Make the cooking process much more enjoyable ! 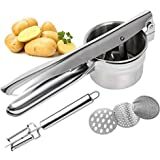 【FDA CLEARED FOOD-GRADE MATERIALS AND EASY TO CLEAN】- Durable and detachable for cleaning.High quality stainless steel with extruder working well and crank arm fitting snugly.These noodle making tools will be your fantastic home kitchen hands. 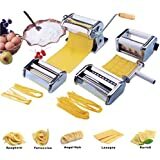 【NINE THICKNESS,TWO KINDS WIDTH FOR PASTA】- 9 kinds settings of dough thickness from 0-2.5mm,clearly marked on the knob. Then you can choose pasta width like 7mm and 2mm,or 3cm square ravioli with wavy edges.Ease your fatigue when cooking. 【ONE YEAR WARRANTY AND 30 DAYS MONEY BACK GUARANTEE】- These professional pasta cutter machines are practical yet warm gifts for your lover,mother,yourself to make many recipes,and even for chef friends. Any questions,Just contact the seller CHEFLY,We would do our utmost to make 100% satisfaction for you! 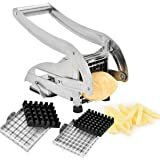 Sold by CHEFLY KITCHEN and sent from Amazon Fulfillment. Homemade pasta is delicious.Not only does it taste better when made fresh, but also healthier and better for you.You have more power over the ingredients that go into your pasta.More timesaving and easier to get the shape and texture just right.If you love food, the perfect pasta dish is one of the best things life can bring.Being able to create perfect pasta in your own home is hard to underestimate. 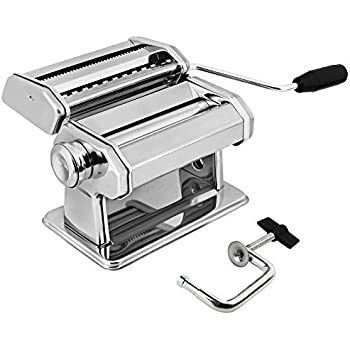 Professional design that involves rolling the pasta through the machine using a manual handle and then using the machine's cutting tool to snip it at the end.They can work reliably for a long time, since the design and parts are fairly classic and unbreakable. 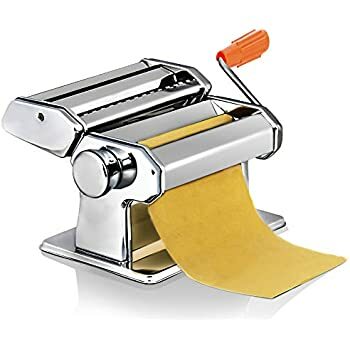 A knob that's easy to adjust to different thicknesses, and a handle that stays in place will add to how easy the machine is to use.Simplify the process of making pasta. 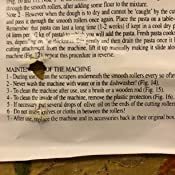 1)Machines that can take apart will often make it easier to get to all those otherwise hard-to-reach nooks when cleaning time comes. 2)Dishwasher friendly materials,You don't need to wash them by hand, taking a lot of the work off of your plate. 7.8" X 7.48" X 5.98"
Great product and good quality, however the description states you can clean in the dishwasher - instruction manual says not to clean in the dishwasher, and never with water! 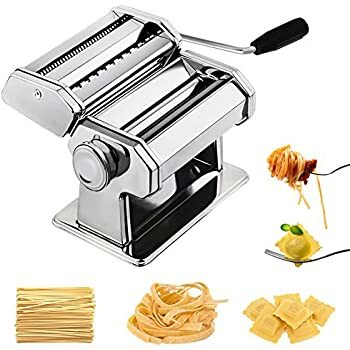 Love this pasta maker, so easy to use, nice size for a small kitchen but very sturdy. Heavy and good quality build. 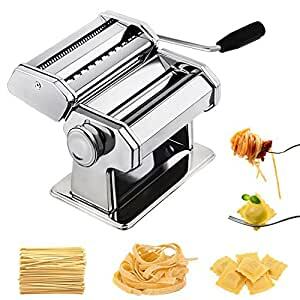 Ordered this as I have always fancied making my own pasta. 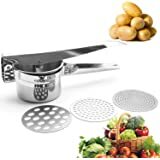 It arrived so thought I would give it a go, it was really easy to use but I had an issue with the machine. I contacted customer support and they were brilliant, they sent me out a new machine and I had it the next day. 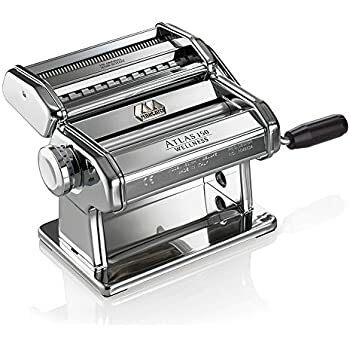 You won’t go far wrong buying this machine. Once you have tried making your own you won’t go back to buying store bought. Bought this for my wife and she makes fabulous ravioli with it...can’t wait til she makes more. Strong and sturdy. Not too big and looks good too.